All transactions are safe and secure with a reliable history in online purchasing behind each of our associates. Buy the Where the Wild Things Are Hoodie to own Where the Wild Things Are clothing and merchandise. 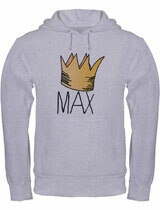 This Max Where the Wild Things Are hoodie sweatshirt features the iconic crown worn by the movie's hero. The crown can also be seen in author Maurice Sendak's children's book Where the Wild Things Are. For the reader in your life, pair this hoodie with a Junk Food t-shirt and the book to make a perfect set. Be sure to check out other Maurice Sendak books, including the controversial In The Night Kitchen, Higglety Pigglety Pop! : Or There Must Be More to Life and The Sign on Rosie's Door. In addition to the Where the Wild Things Are Hoodie above, browse the Where the Wild Things Are Clothing Gallery for more apparel like men's and women's clothes, kids shirts or hoodies.